Creating a positive ecological impact in your garden can be as easy as letting go of excessive fall clean-up. We’ve all done it…prepared the garden for winter. Cut down, hauled off, raked clean or burned every shred of dead plant material in site. Applying a rigorous cleaning at the end of the season is still commonplace, but it’s important to know that scraping the yard clean to make it “ready for winter” impacts the lives of countless garden occupants – butterflies, moths, bees, toads and others – who’s home and plant-centric existence are at the mercy of our industriousness. Nesting and Over-Wintering Bees. Native bees hibernate in a variety of ways in your garden. They may overwinter beneath the woodpile or in a rock crevice. Queen bumblebees hibernate in underground burrows, and in spring they wake up and start constructing a brand new nest. Layers of mulch inhibit the queen bumblebee from building a nest. To encourage nesting bumblebees, leave some areas of bare ground in your garden. Don’t mulch where it is not needed. Leafcutter bees, mason bees and yellow-faced bees, will nest in the hollow stems of many native plants. Leave your native plants standing over winter, and in the spring instead of cutting them all the way down, leave 12 – 15 inches of stalk stubble standing for pollinator nesting sites. Butterflies Hibernate, Too. Declining butterfly populations are one of the best reasons not to clean up the garden. The swallowtails, the cabbage whites and the sulphurs all form chrysalis in late summer using the spent plant material of leaves and stalks for hibernation. Mourning Cloak and Eastern Comma butterflies hibernate as adult butterflies in the plant litter. The Baltimore Checkerspot, Meadow Fritillary, and Red-Spotted Purple all hibernate as caterpillars. In autumn, even though we don’t see it, next summer’s butterfly and moth populations are rolling up in the fallen leaves to hibernate. When we cut down and clean up our gardens, we are removing overwintering sites for butterflies. 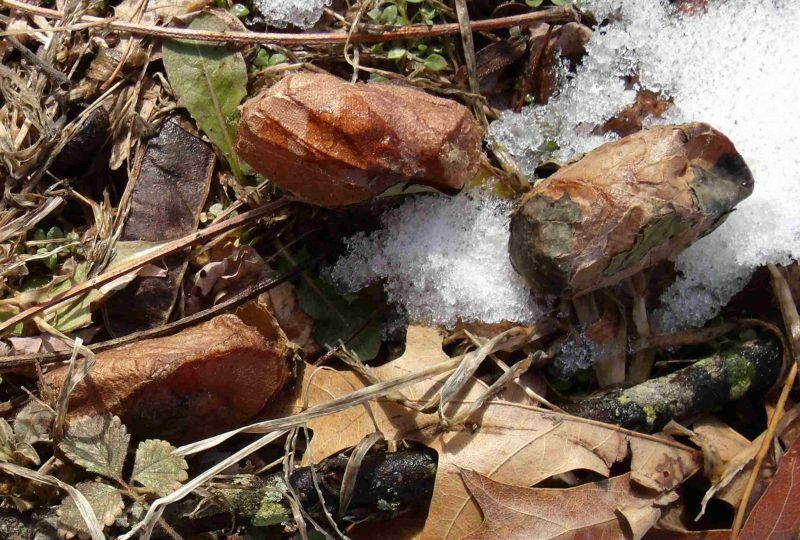 Luna moth cocoons exposed in the melting snow. Photo by David Britton. Birds Need Your Plants. A yard that’s been scraped clean and bare gives the birds good reason to fly on by. 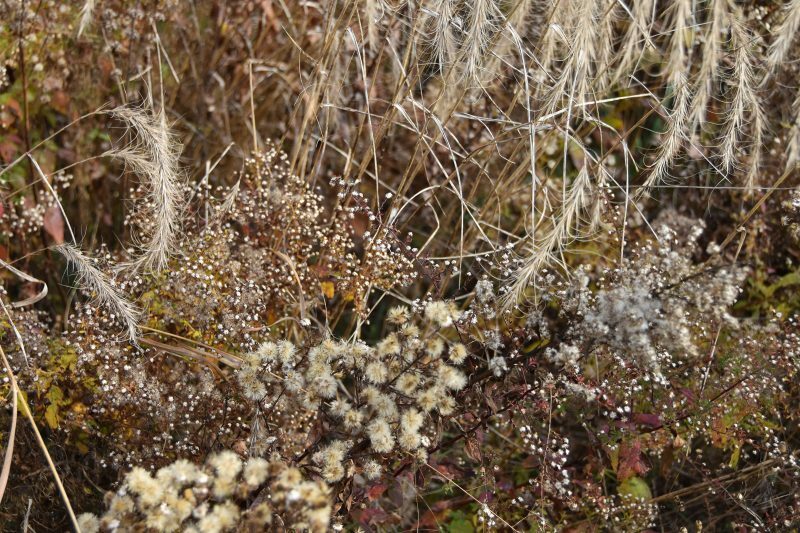 From a birds aerial perspective, a highly textured landscape signals a diversity of plants and better opportunity for food.The seedheads offer food to fall migrating birds and birds that stay for the winter. The standing, spent plants offer screening and a safe place for the birds to forage. In spring, the extra plant material means that there are more insects, and insects are a critical food source for nesting birds as they feed their young. All songbirds raise their young on insects and worms. Your native plants provide the right material, the right environment, and the right nutrition, just when the birds need them. Toads and Salamanders Live There. It’s all making sense now. Where do these little critters overwinter? In spent plant material or in the ground, protected by the plants. What do they eat when they emerge? Insects. Toads are beneficial in the garden as they constantly consume insects snails and slugs. Toads dig deep down into loose soil to hibernate through the winter. To encourage toads, you can offer a safe winter retreat areas by stacking up rocks and leaving a toad-sized space beneath them. Situate the hibernation spaces under a bush, or any insulated and protected spot in your yard. Insulation, Protection and Mulch. The spent plants, and the snow they gather, add a layer of insulation that protects the plant root from harsh winter winds and frigid temperatures. The plant layer protects the many hibernators hunkered down within. Wait until spring to cut down the plants. They can be laid on the ground immediately as a mulch layer, or removed to a designated spot, away from the garden where they will continue to provide nesting and over-wintering opportunities. Free Plant Seedlings. When plants self-seed there are several ways to address the proliferation of plants. 1) You can let ’em grow – some plants have shorter lives than others, and the self-seeded plants will replace the old ones. Remove some of the seedlings, and leave others to grow and fill-in as needed. 2) Move the new seedlings to a different location entirely or pot them up and share them with friends. 3) Some plant species are abundant self-seeders that can be difficult to keep up with if they are not favored by birds. 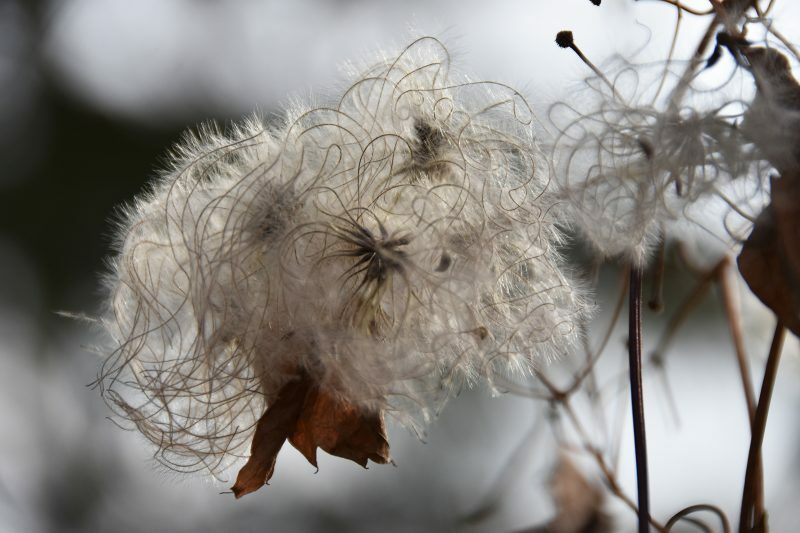 If this is the case remove most of the entire seed head from the species that the birds seem to ignore, prior to seed dispersal. Immeasurable Beauty. The winter garden has a quiet, restful beauty. Red brown, black and gold seedheads, leaves and stems. Cripsy mounds of snow covered stalks. Frosted leaves and glittering grasses. Native plants are beautiful in all seasons – let them play their part in bringing your landscape to life. If you want to support life in your garden, leave your natives standing over-winter. It does have its challenges. The desire for order can be strong. And a clean, tidy yard presents an image of our industriousness and good work ethic, for all to see! Understanding the effect of our actions upon the garden environment is the first step. So the next time you head out with pruners in hand, think about the life that is harbored there – life that depends upon those plants. A garden is a living event, a place of interconnectedness and wonder. Next spring, when we emerge from our winter hibernation, we can greet the garden with even more anticipation for all of the life it holds.